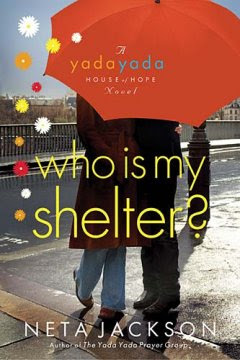 Who Is My Shelter? by Neta Jackson is the story of Gabby Fairbanks. A middle-aged woman going through a difficult separation from her husband Phillip, after being thrown out of her own home. Gabby is making a new life for herself, raising her two teenage boys, and working at a job that gives her life meaning... running the House of Hope for homeless single moms and their kids. Gabby is a christian who let the promise of romance and a better future distract her from God. But the trials in her life prove to be the very thing that leads her back to Him. And He shows her that He is the only Rock she can lean on. I enjoyed this book so much that I have already bought several books in this series and the one that precedes it. The author began with a series called "The Yada Yada Prayer Group", and in it begins the story of some of the wonderful characters that carry over to the "House Of Hope" series. Neta Jackson's husband, Dave Jackson, also wrote a parallel series to this one that looks amazing. Check it out. I have certainly found another favorite author... she has me hooked! I'm ready to read every book in the series, and the ones by her husband. Neta Jackson is a great writer and her books are very well written. Easy to read and keeps you coming back for more. I recommend this series highly. It's great fun! Mary Ann, thank you so, so much for the beautiful prayer for my friend (and me too) It means so very much to me and I know it will to my friend when I show her. What a blessing it is to be a part of the family of God, and we will also remember you in my prayers :-) Again, it meant so very much! You're welcome Lori! It's a priviledge to pray for others as I've had many prayers sent on my behalf over the years. And prayer is powerful! It is a blessing to be a part of the family of God! What could be greater! And I am loving the Yada Yada series myself. I just bought the first one so I can read the whole series! Use Bottle Tops To Seal A Bag.... Great Idea!